Imagine you’re a passenger in your best friend’s car – and she crashes into the car ahead of her. For many of our clients, this is more than imagination – it’s reality. Being injured in a car accident involving friends can be extremely uncomfortable for all parties involved. If you’ve been involved in a car accident like this, you’re probably asking yourself how you’re going to go about getting compensation for your medical bills, time off of work and pain and suffering from someone you are so close to. Car Accident claims can be complicated – so talking to an attorney experienced in car accident law is important to answer this question specifically. However, there are certain general things you should know if you’ve been involved in a car accident involving a friend. As a general rule, if you have been injured in a car accident, you should pursue a legal claim against every party that is potentially responsible. In some circumstances, this may involve pursuing a claim against your friend. However, we are aware of the difficulty and strain this may put on your relationship – and always approach these situations with compassion and diplomacy. If your friend was irresponsible or careless (i.e. negligent) and was the cause of the car accident, they may be liable to you for damages. It’s completely understandable for victims of car accidents involving friends to want to protect one another and avoid causing financial harm. However, you need to remember that the vast majority of lawsuits seek compensation from an insurance company – not your friend directly. This means that, if you pursue a claim against your friend, your friend will not necessarily have to pay out-of-pocket. It essentially becomes a claim for compensation that you seek from your friend’s insurance company. It still might increase the overall costs of insurance of your friend, but it’s not the same as suing your friend directly. Your friend’s insurance company will be responsible for compensating you for the damages. Although it’s possible that their insurance rates will increase, this will likely happen anyways due to the property damage claim when your friend tries to get her car fixed, or other drivers and passengers pursue a claim. It’s also important not to jump to conclusions. Even if you don’t feel your friend was responsible, sometimes insurance company adjusters will try to argue that they were responsible to deny or reduce the value of the claim. If you do not file a claim against the driver of the vehicle you were riding in, you might only receive a small portion of the amount you are entitled to if your friend is found to be responsible. Lastly, remember that just because you pursue a claim against your friend doesn’t necessarily mean that your relationship needs to be affected. In most cases, people understand that insurance is there for a reason, and if they are truly your friend they won’t want to see you suffer without being compensated fairly. Can My Friend and I Have The Same Lawyer Represent Us In Our Car Accident Claim? The short answer is – it depends. While the rules governing, lawyers do permit joint representation in some circumstances, every case is vastly different. The key, however, is that you and your friend are advised about the issues joint representation can create and that you both make an informed decision to proceed – even with the knowledge of potential issues. There are some cases, however, where joint representation is not permissible even with the informed consent of both parties. This mainly occurs when each client’s positions are in direct conflict with each other to such an extent that a lawyer could not represent one without negatively impacting the other. Given this, if you would like to explore the potential for joint representation, it is best to call us immediately to schedule a time to discuss the unique facts of your case. Hurt in a Car Accident Between Friends? 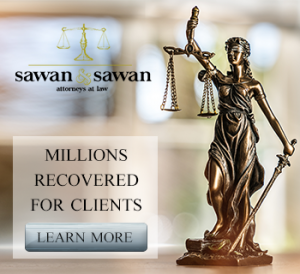 If you were hurt in a car accident while your friend was in the driver’s seat, it’s smart to call the family of laywers at Sawan & Sawan today. We are here to help. Contact us today at 1-866-INJURY-0 to schedule a free initial consultation.